My brother is in town, which is always a good reason for a big family dinner. We were all getting together at my sister’s yesterday for a traditional family favorite—homemade sauce, pasta, and breaded meat. Everyone will be there—Mom’s three children (my brother, sister, and me), her two grandchildren (my sister’s son and daughter, and their spouses), and her five great-granddaughters. Four generations. My sister would be making eggplant and spaghetti squash. Mom and I were to make the sauce and the meat. In my family, we always just called it breaded meat, but it is essentially Milanese steak. Thin cuts coated with seasoned bread crumbs, pain fried, and finished off with lemon juice or sauce. I like mine with just lemon. Even though Mom’s entire heritage going back hundreds of years hailed from Sicily, apparently someone ventured north up the boot and picked up the technique! Mom has been cooking, and cooking breaded meat, her entire life. One of the little things I’ve noticed, though, is that her muscle memory for cooking is beginning to atrophy. That doesn’t mean we don’t cook together. We cook together almost every night. She does the prep. I don’t let her near the stove. But the simple thing of peeling a carrot eludes her now. I give her the carrot. I give her the peeler. But she leaves half of the icky outside on the carrot. And when I tell her to peel more off, she tells me this is how she has always done it. The same thing happened when I set her up at the dining room table for some industrial-scale breading. The classic Milanese technique for breading is to go flour, egg, breadcrumbs. It’s how she’s always done it. It’s how she taught me to do it. But she insisted that she goes eggs, flour, eggs, breadcrumbs. Now, every time we make Milanese anything, be it steak or chicken, we have this conversation. Why a false memory has stuck in her brain is beyond me. But there it is. Wedged in tight. It’s not about whether the breading technique is correct, or even effective. It’s this weird way that her memories have been skewed. It’s the way her habits have been altered. I’ve spent more time in my 50 years with my mother than any other person, living or dead. I know her like I know myself. 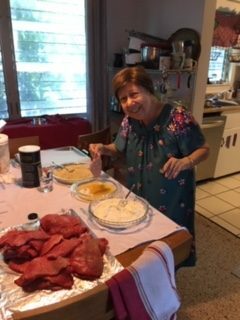 She does things she never in a million years would have done before dementia. She cuts directly on the counter if I don’t give her a cutting board. She walks away from the fridge with the doors wide open. She tries to peel a carrot with a paring knife if I don’t give her the peeler. She wraps left overs in paper towel instead of foil or plastic wrap. She reads in a dark room until I turn on the lights. She cleans the wooden dining-room table with window cleaner if I don’t stop her. She needs to be told how to dust. It’s fascinating. And it’s sad. This is my life as well! One difference is today it might be something like eggs, flour, eggs, breadcrumbs, and tomorrow it could be perfect. Who can guess what that brain does from one minute to the next?